On Thursday's edition of the podcast, the Helpers talk about their favorite sleeper picks and also give out some daily fantasy advice regarding quarterbacks. Daily fantasy football is a blast to play, and if you want to join some contests, here are some links. $100,000 free contest. No charge to you at all. $10 Million tournament. $25 buy in. The 2015 NFL Draft has come and gone, and while fans eagerly wait the start of rookie mini-camps I feel it is the appropriate time to grade how teams fared in the draft. The first edition of the Fantasy Football Helpers draft grades will feature the NFC North, with the rest of the NFC/AFC to come shortly there after. New Bears General Manager Ryan Pace was stuck with the task of bringing some ferocity back to the Monsters of the Midway. With the 7th overall pick in the 2015 NFL Draft, and a new coaching staff that is switching from Lovie Smith’s 4-3 Tampa Two defensive scheme, to Vic Fangio’s aggressive 3-4 defense. After trading Brandon Marshall to the Jets in exchange for a 5th round pick the Bears were left with a massive hole at wide receiver opposite Alshon Jeffery. The addition of Kevin White with the 7th overall pick should provide the team with an instant impact player. Although White may not be as refined as Amari Cooper, who ended up getting drafted by the Raiders, White’s blend of size/power/speed make the Bears wide receivers one of the top young units in football. As far as the defensive side of the football Pace did a great job of adding some meat to the defensive line. Florida State defensive tackle Eddie Goldman should fit in immediately at the 0, or nose tackle position in the Bears 3-4 front. Although Goldman does not possess elite pass rush skills, he is a massive human being that should allow the Bears linebackers to run free to the ball. The most underrated drat pick for the Bears in my opinion came in the 4th round with the selection of Michigan State running back Jeremy Langford. Despite not showing elite athletic ability on tape, Langford lit up the NFL Scouting Combine after posting the lowest 40-yard dash time out of running backs (4.42). Despite having great long-speed, Langford is a versatile back with the ability to make plays in both the passing and running game. With veteran running back Matt Forte entering the last year of his contract and rumors swirling that Forte could hold-out, Langford could be in a position to take over the bulk of the carries in Chicago as soon as next season. Overall, the Bears did not make a lot of splash move outside of the selection of Kevin White, but they were able to add some much needed depth along both the offensive and defensive line. While the Bears rebuild was never considered a one-year process, new GM Ryan Pace did a good job adding some quality young talent that has the potential to become starters. As long as Aaron Rodgers is around the Packers should be one of the elite offenses in the NFL, but if they want the Lombardi Trophy to come home again it is essential to improve on the defensive side of the ball. With the departure of Tramon Williams and Davon House to free agency the Packers were left with a gaping hole in their secondary. With the team’s first round selection the Packers drafted Arizona State safety Damarious Randall, an athletic safety who has the ability play deep as a single-high safety as well as the ability to roll down into coverage against slot WR’s and TE’s. Packers GM Ted Thompson did not stop there when adding young talent to his secondary as he invetsed the team’s 2nd round selection into the intriguing Quentin Rollins, a former 4-year starter on the Miami (OH) basketball team who has played just one year of college football. Despite the lack of experience playing football at a high level Rollins showed great ball skills and impressive instincts. 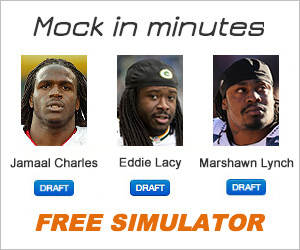 After the first two picks for the Packers I really started to question the moves the team made. The team drafted Stanford offensive weapon Ty Montgomery with their third round selection. Although Montgomery possesses some unique skills with incredible athleticism, he is extremely raw as a receiver and will most likely be relegated to KOR or PR duties during his rookie season. Despite the selections of Ty Montgomery and Brett Hundley I feel the Packers had a solid, but not great, draft. Randall and Rollins should be day 1 starters for the Packers, and 4th round selection Jake Ryan could see some playing time during his rookie season now that A.J. Hawk has signed with the Bengals. Although the draft was not as flashy as teams like the Titans, Vikings, or Jaguars, the Packers did add two starting caliber players and should continue to be one of the premier teams in the NFC this season. As much as I miss the days of Matt Millen being the GM of the Lions and investing in wide receivers year in and year out, the Lions have shed the laughing stock label and become one of the better drafting units under Martin Mayhew. Under new offensive coordinator Joe Lombardi the Lions passing offense took a step back, finishing outside of the top-3 for the first time in three seasons. Part of the issue with the Lions offensive inconsistencies lay within the deficiencies along the offensive line. With the addition of first-round pick Laken Tomlinson the Lions have an immediate upgrade in terms of pass-protection. During Tomlinson’s last season at Duke he established himself as one of the top pass-protecting lineman in the nation, allowing 0 sacks and 0 QB hits during his senior season. If Matthew Stafford is going to make the jump from being an above average quarterback into the upper echelon the addition of Tomlinson to one of the better offensive lines in the NFC North should help immensely. For all of the dynasty owners that thought the departure of Reggie Bush to the 49ers would mean an increased role for Theo Riddick, those thoughts were quickly put to bed after Lions invested their 2nd round pick on Nebraska’s Ameer Abdullah. Despite not having the frame of a typical 3-down running back, Abdullah runs with underrated power between the tackles and is matchup nightmare when used as a receiving option out of the backfield. With Joique Bell struggling to hold onto the ball consistently (11 fumbles lost since 2012) and just one more year left on his current contract, Abdullah could push Bell for the starting job as soon as next season. While the Lions draft does not possess a lot of fantasy relevant draft picks, they once again filled plenty of needs. The additions of Alex Carter and Quandre Diggs to the secondary should provide some quality depth behind Darius Slay and Rashean Mathis, as the Lions continue to have one of the best defensive units in all of football. Teams of the NFC North beware; Vikings Head Coach Mike Zimmer is building a juggernaut on the defensive side of the football. After investing in Harrison Smith, Anthony Barr, Xavier Rhodes, and Shariff Floyd in the first round over the last 4 years, the defense is loaded with young talent just waiting to take off. Although I thought the Vikings would go with wide receiver DeVante Parker or defensive end Bud Dupree in the first round, the team made the wise move and added the physical press-corner Trae Waynes out of Michigan State. Waynes, if all goes well, should fill in immediately as the team’s no. 2 CB this season opposite Xavier Rhodes. The addition of Waynes was just the start for the Vikings, as they added ILB Eric Kendricks and LSU DE Danielle Hunter with the teams 3rd and 4th round selection. Kendricks, an “undersized” linebacker from UCLA should be an immediate starter for the purple at either WLB or MLB. Despite being a tad bit undersized for an NFL ILB, Kendricks has a nose for the football and is underrated in coverage. Guys like Chris Borland have gotten me to realize that linebackers who are tackling machines in college, translates very well to the NFL game. Hunter is an intriguing defensive end prospect with elite size (6’5”, 252 lbs. ), speed (4.57), and incredibly long arms (34 ¼). Despite being raw as a pass rusher Hunter has all the physical tools to be a dominant RDE at the NFL level. If Vikings Head Coach Mike Zimmer and Defensive Line Coach Andre Patterson Sr. can get Hunter’s physical tools to show up on the field, the Vikings could have one of the steals of the 2015 NFL Draft. If second year quarterback Teddy Bridgewater is going to take the next step into being one of the elite quarterbacks in the NFL, the Vikings have to find a way to protect him better. With the additions of Pittsburgh tackle T.J. Clemmings, Oklahoma’s Tyrus Thompson, and Alabama’s Austin Shepard, the Vikings added some much needed depth to the offensive line. Of all the teams in the NFC North the Vikings had the most impactful draft of any team. With two players that will step in and be day one starters (Waynes, Kendricks), and four players that have the ability to develop into starting caliber players (Clemmings, Hunter, Diggs, Pruitt) the Vikings not only had the top draft in the NFC North, but one of the top in all of football. In the 2011 season, Matthew Stafford entered the group of fantasy elite QBs when he tallied 5,038 passing yards, 41 TDs and 16 INTs. It was only his 3rd year in the league and he joined the top tier of fantasy QBs that included Peyton Manning, Aaron Rodgers, Drew Brees and Tom Brady. Fantasy experts saw a young QB with a rocket of an arm, an offense who passes more than anybody, along with the best WR in the NFL, Calvin Johnson, and decided to anoint Stafford as the next big thing at the QB position and a player who would produce fantasy greatness for years to come. The following year Stafford set the NFL record for passing attempts but his TDs fell dramatically from 41 to 20. We heard a lot of stories about how many times Lions players were tackled inside the 5 yard-line and even at the 1 yard-line and we heard that his 20 TD season was a fluke. He’d be projected as a top 6 QB once again. Well, two more years have passed since Matthew Stafford’s 41 TD outburst in 2011 and in that time frame eleven different QBs have thrown 30 TD passes….none of them are named Matthew Stafford. In 2013, he fell just short with 29 TDs but then followed that up this season with an abysmal 22 TD passes. I think it’s safe to say that the last three years are not all flukes, but that Stafford was just too hyped after 2011. Year after year fantasy owners have been spending a relatively high draft pick (ADP round 3-5) on Stafford and coming away disappointed while chasing what may be the real fluke, 2011’s stats. In 2014, Stafford bottomed out setting his low mark in passing yards in 4 years and his 22 TDs ranked 14th at the position, one above rookie Derek Carr. Heading into the season, experts and fantasy players were once again expecting Stafford to produce, with a 4th round ADP (46th pick overall) so the question is….what happened? Joe Lombardi took over as offensive coordinator for the Lions this season replacing Scott Linehan who was released when Jim Schwartz was replaced by Jim Caldwell as the Lions head coach. Linehan had done a decent job developing Stafford since he joined the staff in 2009 including the career year in 2011, but the Lions opted to go another direction and clear house upon the firing of Schwartz. They brought in former Saints QBs coach Joe Lombardi, a Sean Payton disciple to run the offense. Lombardi’s recognition as an OC candidate came to fruition while Sean Payton was suspended following the bountygate scandal. The Saints didn't suffer on offense and many believed Lombardi was the reason. Stafford had all the tools for Lombardi to mold Stafford into the next Drew Brees, a comparison that started popping up upon Lombardi's hiring. Golden Tate was added to bookend Calvin Johnson on the outside, and as it turned out to complement him in the slot. Having played in a conservative offense in Seattle, it was unknown how good Tate would be but one thing was for sure, he was better than the man he’d be replacing in Nate Burleson and/or Kris Durham. In addition, the Lions used their first round pick on Eric Ebron, a physical specimen with great hands at tight end. These changes once again had everyone aboard the Stafford hype train. Stafford’s first week in Joe Lombardi’s offense could not have been scripted any better. On the first drive of the game, Stafford found Calvin Johnson all alone for a 67-yard touchdown down the right sideline. He was all by himself, with nobody within 20 yards of him. On the second drive, he’d catch a 16-yard TD pass and was almost just as open. Stafford finished with 346 yards and 2 TDs passing, a rushing TD, and 0 turnovers in an easy 35-14 victory. The success of the high flying offense was a great start for the Stafford/Lombardi relationship and the Brees comparisons were all over the media. Little did they know, the Giants were just that bad of a defense. Over the next 10 games the Lions would go 6-4. They found themselves in a race for the division lead, but it was due to their top ranked defense, not their quarterback. Stafford had only 11 TDs and 10 INTs during this stretch, while only throwing for 300+ yards once. His top performances (2 passing TDs each game) came against the Jets, Saints and Falcons….and the way those defenses were playing, should those even count as good games? Calvin Johnson sustained an ankle injury in week 3 against Green Bay. He played the next 2 weeks as a decoy combining for only 3 catches and 19 yards. The Lions decided to shut him down for the next 3 weeks. Basically five weeks were played without Calvin Johnson, a scene all too familiar to Lions fans. Stafford didn’t actually have his worst weeks without Calvin, but his improvement in the new offense had to be put on hold while they waited for Calvin to get healthy. The one positive to come out of the injury was Stafford’s new found chemistry with breakout WR Golden Tate. Tate basically put up Calvin-like numbers during this stretch. In the five games that Calvin was either a decoy or out, Tate had four 100 yard games (three over 134 yds) and surpassed seven receptions in each game. He made two game winning TD catch and runs, one against the Saints and the second against the Falcons. This chemistry would carry through the rest of the season even when Calvin returned and Tate became a dynamic number two option,a mismatch against #2 CBs who could take it to the house on any play. 2014: Weeks 12-17 – Finally! After a brutal 10 week stretch and back to back 0 TD weeks heading into week 12, Stafford was written off for good as a fantasy option. However, something clicked against the Bears that week that stuck for the remainder of the season. Sure, the Bears are one of the worst defenses in the league, but Stafford looked absolutely incredible on Thanksgiving Day throwing for 390 yards and 2 TDs on 34/45. In the final 5 weeks Stafford threw for 9 TDs and only 2 INTs while the Lions finished winning 4 of their last 5. He had his first two 3 TDs games and had two 300+ yards outings during this time. His most impressive game was actually a loss where he had 217 yards 3 TDs 0 INTs at GB in week 17 to end the season. Sure, Aaron Rodgers out dueled him but putting up those numbers in Green Bay in December is something that only a guy like Rodgers does. Stafford may be undervalued next season and I believe he will improve significantly. I’m going to give him one more try as long as his ADP puts him in the middle rounds. He finished the season red hot and started realizing Joe Lombardi’s vision on offense. His chemistry with Golden Tate is tremendous for his prospects of breaking out next season. Calvin Johnson is still as good as he always was and if he could ever stay on the field we could see something really special. However, I don't mean top 5 QB when I say really special. For one, the Lions defense is elite. If they can retain Ndomukong Suh next season, then it will remain elite. In addition, the running game is much improved. Joique Bell has settled into the Lions work-horse back and was able to close out games by picking up late first downs and eating clock. The team no longer needs to rely on Stafford’s arm to win games. This formula was successful and will not be changing if the defense remains intact. Keep an eye on Suh’s status because if the defense gets worse it will really help Stafford’s fantasy value. Stafford will enter year two with confidence in Joe Lombardi’s system. Lombardi was quoted as saying “Looking back, I kind of tried to drop maybe some responsibilities on him that maybe a quarterback like Drew didn’t get until four years into the system in New Orleans. “We asked a lot of him and he responded...” Stafford will have another year under his belt throwing balls to Golden Tate and while Eric Ebron did very little (as almost all rookie TEs do), we can expect a significant improvement in his game. I do think Stafford will reach 4500 yds and 30 TDs next season. In a way too early mock draft on NFL.com he was the 14th QB off the board in the 12th round. Getting Stafford at that value is highway robbery. I anticipate his value improving the offseason and would target him as the 10th QB starting in round 8. On Monday's Week 15 edition of First Aid, the Helpers analyze Seattle/San Francisco and Detroit/Minnesota and give out fantasy value to the players in those contests. Plus weekly awards and a quick preview of Chicago/New Orleans tonight. Enjoy. Editor's note: Our bullet point articles are written to better explain our weekly rankings, which you can find here. Bell has been one of the biggest surprises of this season. Yeah, he was expected to be a solid RB2, but the numbers he's putting up are reminiscent of Kansas City running back Jamaal Charles. Like Charles, Bell managed to string together an eight catch, 159 yard receiving effort that was similar to Charles' eight catch, 195 yards receiving against Oakland in 2013. The major difference between those two games were the touchdowns though, as Charles found the end zone four times while Bell didn't score once. Scoring shouldn't be an issue for Bell this week though. The Bengals give up the sixth most points to fantasy running backs (19.6 per game) and Bell has rushed for a touchdown in last two contests. He's on pace for 2,000 total yards this season, making him one of the most versatile fantasy backs of the 2014 season. He's as good a bet as any to rush for 100 yards and score two touchdowns this week. From one Bell to another, Joique is coming off his best game of the season where he rushed for two touchdowns and 91 yards against the Chicago Bears on Thanksgiving. He's been somewhat inconsistent when finding the end zone as he hadn't scored four weeks prior to his two-touchdown effort. Even with that, he's been the most reliable running back on the Detroit Lions, averaging 52 yards per game. He also has a good matchup against a bad Tampa Bay rushing defense that gives up 18.1 fantasy points to running backs. The Buccaneers defense has played a little better since the start of the season, with Gerald McCoy being a plug up the middle. But while the Buccaneer front four has given Tampa an edge, teams can still run the ball on them with reasonable success on the edges. Matt Forte rushed for 89 yards and a touchdown on 23 carries (3.9 ypc) and the Bengals dual threat of Giovani Bernard and Jeremy Hill combined for 109 yards. Tampa's secondary ranks among the worst in the league as well, so Bell's receiving ability in the flat and on short routes could be equally effective. He's a good flex play this week. Mason has a lot going for him in this matchup, and it starts with all the problems going on in Washington. The Redskins have been a mess in the locker room, with reports that Jay Gruden wants quarterback Robert Griffin III off the team after this season. It's so bad that even one of his own teammates blasted him over the weekend. When your team has lost confidence and seemingly the will to play hard because of negative vibes, it's never a good situation. And that's not just some woo-woo speculative armchair analysis (ok maybe a little) but it really does impact a team's performance on the field. Defensively, The Redskins have been very stout against the run this season but injuries are starting to take a toll. Starting linebacker and leading tackler Keenan Robinson has been battling a sprained MCL and hasn't practiced all week. Sack leader Brandon Meriweather (also a prolific tackler) is battling a sprained toe and hasn't practiced either. Meriweather is listed as doubtful while Robinson is questionable. Key pass rusher and run stopper Jason Hatcher is also questionable as is Chris Baker. On offense, DeSean Jackson is dealing with a shin injury and didn't practice Friday, he may be a scratch as well which could limit the offense since he's Washington's leading receiver. Now on to the Rams. Mason had his coming out party against the Raiders last week, rushing for 117 yards and two touchdowns on 14 carries. He's become one of the key factors in the Rams' success. When Mason rushes for at least 60 yards, the Rams are 4-1 and when he rushes for over 100 yards, the Rams are 2-0. Expect St. Louis to ride Mason once again and while he might not explode for the big yardage he did against Oakland, he should still hover around the 70-90 yard mark and one touchdown. Shoelace will need to double knot this Sunday after falling back to earth over the last few weeks. After several strong performances that included back-to-back 100 yard games in relief of starter Toby Gerhart earlier in the year, defenses are gearing up for him better. Teams are stacking the box since they know Robinson is perhaps the biggest offensive threat with Blake Bortles still going through growing pains as a rookie. All of that planning has really limited Robinson's value. Another reason for caution could be Robinson's struggles in pass blocking. The Jaguars surrendered seven sacks to the New York Giants last week, and two of those were a result of Robinson's blown coverage. Dealing with a pass rush that includes J.J. Watt this week won't make it any easier. If the Jaguars elect to pass more and go after Houston's weak secondary, Robinson could see a smaller portion of the snaps. The Jaguars have also been experimenting a lot since they know they're no longer in the playoff chase. Bortles will continue to get his reps so the staff can evaluate him and while the rookie quarterback is nursing shoulder and ankle injuries, expect the Jaguars' staff to keep testing out his skills so they can help him improve next season. If they pass a lot against Houston and Robinson is forced to come out due to his pass protection liabilities, then Shoelace could get lost in the shuffle. On a special Thanksgiving edition of Diagnosis, the Helpers break down each game on the Thanksgiving slate including the Eagles/Cowboys, 49ers/Seahawks and Bears/Lions. They talk about every relevant fantasy player in those matchups and finish the podcast by sending out love letters of thanks to the players who have helped them throughout the fantasy season on their own fantasy teams. Also, check out our weekly rankings here. Mark Sanchez — Sanchez has been playing adequately in replacement of Nick Foles, and is a solid QB1 option against a bad Dallas secondary. While Sanchez is prone to turnovers (he's averaging about two interceptions per game) the high octane offense of the Philadelphia Eagles combined with the good matchup should keep him in the 15-20 point range. Tony Romo — Romo is in line for a big week. The Eagles have one of the worst defenses against the quarterback, surrendering 19.5 points per game. Only the New York Jets allow more. He's a must-start for Week 12. DeMarco Murray — Obviously a must start, Eagles are better against the run than the pass, but the offensive line of Dallas is far and away the best in the league right now. Expect another 100 yard rushing day. LeSean McCoy — McCoy is finally starting to recapture the elusiveness that helped him claim the rushing title last season. When he makes guys miss in the open field, he rattles off big gains. McCoy found the end zone last week and recorded his first game of 100-plus rushing and a score. He's a must start this week. Jeremy Maclin — A must-start WR1 as always. With 980 receiving yards on the season, Maclin is ready to eclipse the 1,000-yard receiving mark for the first time in his career. He remains one of the best ADP draft bargains of 2014. Jordan Matthews — Continues to thrive as the No. 2 receiver with Sanchez under center. It's impossible for Matthews not to be productive based on Sanchez's strengths in the intermediate game. Dez Bryant — Clear cut WR1 in a great matchup. Bryant should near 100 yards and find the end zone at least once this week. Terrance Williams — Not startable due to a low volume of targets, but the Eagles do give up quite a few points to receivers. If you're very desperate, there's some upside to this matchup. Zach Ertz (sleeper*) — The Cowboys are one of the worst teams in the league at defending the tight end, giving up 10.1 fantasy points per week to tight ends on average. They've also given up a league-worst 72 receptions to tight ends on the year. Vernon Davis, Larry Donnell and Jimmy Graham have all carved them up. Jason Witten — Remains a very solid TE2 against a defense that hasn't fared well against tight ends with DeMeco Ryans out. Matthew Stafford — We know he's played bad recently, but Stafford has a great matchup at home against a bad defense. He's a great option this week. Jay Cutler — Rated our No.17 QB in our weekly rankings, Cutler continues to struggle with turnovers and overall poor production. The only upside is the Bears will likely be down in this game early which could mean plenty of garbage time yards. He's a QB2. Reggie Bush — He's expected to start today, and is a desperate play even with a good matchup. Still, the Lions could use some help at running back as they're one of the worst rushing teams in the league. There's some element of home run potential here. Joique Bell — Still a great flex play in PPR leagues. Matt Forte — Don't be scared off by the tough matchup even for a second, Forte's one of the best receivers out of the backfield in the league right now. Any rushing yards negated by a tough Lions run defense should be made up for in the passing game. Brandon Marshall — Played much better lately, he's got 8 touchdowns on the year but three of those came in one game against San Francisco. He's still a must start in 12-team leagues. Alshon Jeffery — Wide receiver who is always a must start. He's scored three touchdowns in the last four games. Calvin Johnson — Megatron could be in line for his best game of the season. The Bears will be without their top defensive back in Kyle Fuller and Johnson has seen target numbers of 15,12, and 10 in his last three games. Golden Tate — Tate is a solid WR2 in a plus matchup. His 97 receiving yards were a lone bright spot against New England last week, and he's already eclipsed the 1,000 yard receiving mark for the first time in his career. Martellus Bennett — A guy who doesn't get enough credit. Bennett struggled last week but also strung together a 134-yard effort against the Green Bay Packers. The Lions one weak spot comes in defending tight ends, so Bennett has upside in this matchup. Eric Ebron (sleeper*) — Injuries have slowed what was expected to be a good rookie season for one of the top tight ends of the 2014 draft. Ebron has a great matchup against the Bears, who rank dead last against the tight end (10.9 fantasy points per game). Expect Stafford to look for him in the red zone. Preparation in fantasy football is always crucial to victory. Each week, it's like a mad dash to see who can make the right pickups first and who's ahead of the injury and matchup curve the most. As the playoffs draw near, the planning that goes into having a strong lineup in Weeks 14,15 and 16 are the staple of every fantasy owner's season. Those three weeks mentioned above are the big climax for fantasy owners, and they want their matchups tastier than a Chip Kelly personalized smoothie. If you're already thinking your team is destined for the playoffs, then you may want to look into how you can fortify your team to make it even more tough to beat when it really matters. Here are some matchups for Week 14 that could be plausibly fruitful. With a little over 100 yards receiving and just one touchdown, the tight end dubbed the second coming of Vernon Davis hasn't had a very productive rookie season due to a nagging hamstring injury that's kept him out of action for nearly half the season. Still, he's eventually expected to return to the lineup in Week 11 and has a good matchup down the road against a Tampa Bay defense that ranks second worst in the league against the pass. In a pass heavy offense loaded with plenty of receiving talent, it's not out of the question Ebron could get lost in the shuffle playing along guys like Golden Tate, Brandon Pettigrew and Calvin Johnson. Despite the possibility of low targets, he's still a good TE2 option just because of his athletic upside and a favorable matchup. With tight ends like Jordan Cameron and Vernon Davis constantly hurt, Ebron could be a good savior if you're weak at the TE position. Carolina's offense has really struggled these past three weeks. They haven't scored more than 20 points since they tied Cincinnati 37-37 back in Week 6. Panthers QB Cam Newton has been playing hurt with two bad legs, which could severely limit his upside as a rushing quarterback. The Panthers running game has been non existent with their running backs averaging just 3.6 yards per carry. Jonathan Stewart heads their paltry rushing attack with 299 yards on the year. The Panthers receivers have also been inconsistent, with Greg Olsen serving as the team's best option with 51 catches. Rookie Kelvin Benjamin has shown flashes but his route running and consistency haven't been there, as evidenced by his 43 catches on a whopping 85 targets. He's basically catching just half of the balls thrown his way. Jerricho Cotchery is still without a touchdown on the season and looks as every bit out of place as many thought the vet would be in a role too big for a guy of his age. On the other side, the Saints' defense has improved mightily. They've registered five interceptions in their last four games and have sacked the quarterback at least four times in their last three games. Surprisingly, they rank in the top 15 in yards allowed as well. While divisional matchups can often be close, the Saints defense could be worth a play due to Carolina's struggles on the offensive end. The Jacksonville Jaugars lost their most targeted receiver, Allen Robinson, to a broken foot which will sideline him for the remainder of the season. With Robinson out, expect the speedy Hurns to be the primary benefactor in the Jaguars' offense. Quarterback Blake Bortles has thrown for at least 200 yards in all but two starts, and he's eclipsed the 300 yard mark once as well. He moves the ball down the field consistently. Hurns suffered a concussion during the Jaguars' last game against Dallas, but he still leads the Jaguars in touchdowns (5) and with Robinson now out, expect Hurns to see more targets which should increase his yardage totals and overall consistency. Plus, he's still available in nearly 80 percent of Yahoo! Leagues. Shorts is second on the team in targets (61) and has two 100 yard games on the season. These two receivers are good options in Week 14 because of their matchup against the Houston Texans, a team with a secondary known for getting burned throughout this season. The Texans are allowing 279 passing yards per game, which ranks 29th in the league. Hurns will have major upside as a WR3/flex guy in a bigger role with a good matchup. I know, Williams has been an inconsistent player at times. But he's still on pace for 11 touchdowns and 700 receiving yards. Williams and the Cowboys will have a gift wrapping of a matchup against the Chicago Bears in Chicago on Week 14. The Bears have allowed 268 passing yards per game, which ranks 28th in the league. They're also surrendering around 30 points per game. Williams is coming off a poor game against Jacksonville where he only saw two targets, but they still took shots at him in the end zone. He's been a big part of the Cowboys' receiving game this season and while he may be feast or famine, he's unlikely to fade in an offense that values his contribution. On this week's episode of Diagnosis, the Helpers discuss their good and bad calls from Week 10, the state of the Arizona Cardinals and Detroit Lions and what to expect from this Thursday's matchup between the Buffalo Bills and Miami Dolphins. The Helpers start off their best and worst calls. First, they hit on Michael Vick, the quarterback for the New York Jets. In his second start, Vick was coming off an impressive start against Kansas City, and he paid off for those who started him. He finished with 132 passing yards and 42 rushing yards. He finished as the seventh overall quarterback for Week 10, showing off the vintage Vick traits which included some nice deep passes and had the New York Jets not have been blowing Pittsburgh out, would've likely thrown for more yards. One run in particular, came off a scramble which ended up being about a 20-yard run that nearly resulted in a touchdown. Also, Vick had no turnovers, which is something he's had problems with throughout his career. Fantasy owners have always been wary of Michael Vick and for good reason. His small frame has never lent itself to taking too many big hits in succession. Vick is best used in fantasy as a plug and play guy in good matchups as long as he's healthy. One miss the Helpers had for Week 10 was Kansas Chiefs running back Jamaal Charles, who they pegged as a likely bust in a tough matchup against Buffalo. The Bills held Charles in check for three quarters, and Charles only had 29 yards at the end of the first half. But Charles broke a big 40-yard touchdown late in the game which helped his value. Of course, that's not saying that the Helpers were right about Charles — they weren't. But the Bills were one of the best defenses against the run coming in, and they did play well enough to contain Charles for a half. But as all home run hitters do, Charles answered with a big gain which helped him finish with 98 rushing yards and a touchdown on the day. He probably won't be recommended as a bust going forward unless the matchup is exceptionally bad or he's battling some type of injury. Another player the Helpers dubbed a sleeper for Week 10 was Detroit Lions running back Theo Riddick. Riddick came into the Lions matchup against Miami having scored two touchdowns in the last two games and he repeated that feat again. It came on the very last play of the game, but Riddick's score gave him six points which helped fantasy owners who started him get some value. Riddick and the Lions have another tough matchup against the Arizona Cardinals, but starting running back Reggie Bush is still banged up and saw just five touches against Miami. You have to keep Riddick stashed away just in case Bush can't go in Week 11. Riddick has now scored three touchdowns in his last three games, and appears to have cemented his role as the primary receiver out of the backfield. Editor's note: This is a column to better explain our quarterback/defense rankings for the week. You can find them both here and here.